Fans gathered at Rose Bowl Stadium tonight for the Drum Corps International World Championship Semifinals. The top 17 corps in the world took to the field tonight, giving fans and each other some of the greatest performances of the year so far. The Blue Devils (97.300) won tonight's World Championship competition, barely placing ahead of the Cadets (97.250) and the Cavaliers (96.775). Blue Devils will now look for a sweep of the championships competition and hope to finish strong for their home-state crowd. "It was a great performance for the corps tonight and everything is getting very consistent," said David Gibbs, director of the Blue Devils. "We're gearing up for tomorrow night and we're excited for our last show. We backed off of the kids a little bit tonight, so I think we have a couple more gears left in us for tomorrow night's performance." The Cadets and Cavaliers put on powerful performances as well and are excited for an undoubtedly strong finish to their competitive seasons tomorrow night, as less than six tenths of a point now separates the top three corps. "Tonight's performance was excellent. The corps has been great for a long time now, but I'm really proud of them tonight," said George Hopkins, director of the Cadets. "Tonight, the corps really wanted to prove that the show and everything we've put into it is worthy. It's great to be in the mix again right now." Phantom Regiment (95.400) secured the fourth place position again tonight while the Santa Clara Vanguard (94.050) had their strongest performance of the season. The corps jumped up two positions to fifth place, finishing ahead of Carolina Crown (93.875) and the Bluecoats (93.750). "Tonight was a great performance and I'm very pleased with the power that the corps brought with them," said Jeff Pearson, director of the Santa Clara Vanguard. "Our rising placement tonight was a big leap for us, but it's still a very tight spread and anything can happen. Tomorrow night, we're going to do exactly what we did today, and we'll make sure the members are ready to perform, do the best that they can do and have some fun." The Blue Knights (90.450) held their lead ahead of the Boston Crusaders (89.450), and the Glassmen (87.025) again edged ahead of the Colts (87.000) while the Spirit from JSU (85.500) earned the final spot in this year's elite top 12. The Academy (84.500), Blue Stars (84.350), Madison Scouts (81.850), Crossmen (81.600) and Pacific Crest (79.525) had their final performances of the season tonight and will now retire each of their programs to the history books. After the evening's competition, the Individual & Ensemble winners and the new Hall of Fame inductees were brought to the field and announced before the crowd. Howard Dahnert, Jay Kennedy, Larry Kerchner and Steve Vickers are this year's newest members of the Drum Corps International Hall of Fame. The Kingsmen alumni corps also put on an entertaining and nostalgic performance for fans at the end of the night and soon after that, the age-out ceremony was held. Drum Corps International celebrated and recognized more than 600 "age-outs" at this event and the night will certainly be one they'll never forget. 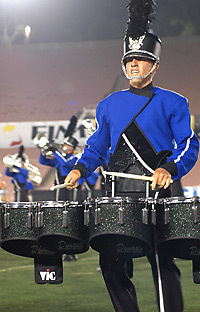 The 2007 Drum Corps International World Championships will come to a close tomorrow night at Rose Bowl Stadium in Pasadena, Calif., after more than 130 exciting events from this year's Summer Music Games Tour. As the scores and placements continue to rise, drop and switch even through this second to last competition, the excitement for tomorrow night's competitive outcome continues to grow. 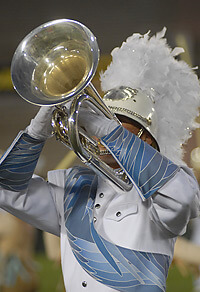 In less than 24 hours, the 2007 World Championship corps will be named, but the competitive season is not over yet. View the complete scoring recap.